You can feel the excitement on the flight deck. As the jet engines roar an F/A-18E Super Hornet, from the “Blue Diamonds” of Strike Fighter Squadron (VFA) 146, goes soaring into the air. This launch was a bit more special than the other approximately 30 launches performed daily on USS Nimitz (CVN 68) during its 2017 deployment. It was historic. The ship successfully completed its 100,000th aircraft launch from Catapult Two Sept. 25, marking the second time, since the ship’s commissioning in 1975, that that milestone has been achieved. Catapult One launched its 100,000th aircraft on October 7, 2009. 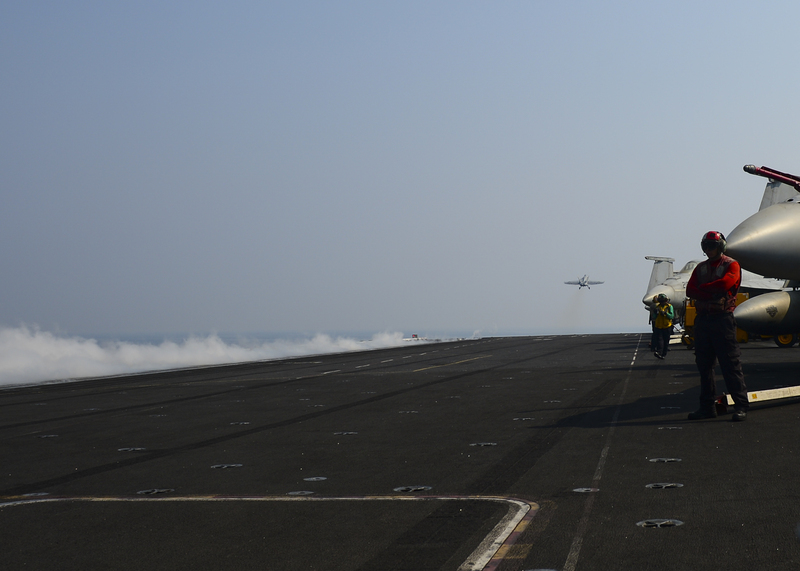 Getting Catapult Two to this milestone is exciting for the crew that works on these catapults daily as they know all that goes into each and every launch, said Nimitz’ Aircraft Launch and Recovery Equipment (ALRE) Officer Lt. j.g. Gabriel Quinlin, from Indianapolis, Indiana. “The reason 100,000 shots is a significant milestone is because every catapult shot requires maintenance,” said Quinlin. Quinlin has been Nimitz’ ALRE officer since May, 2015 and has seen the tremendous work it takes to get these catapult ready for the daily grind of being on deployment. “Catapult Two was in pieces before we left for deployment, and it took a complete overhaul and an immense amount of hard work from the crew to get it up and ready to go,” said Quinlin. Since the Nimitz has been deployed, this catapult alone has been responsible for over 1,200 launches. This is thanks in large part to the crew who work diligently everyday behind the scenes and below deck to make sure each launch on the flight deck is a successful one, said Quinlin. “100,000 launches, 42 years of service, and this ship is still out here getting the work done,” said Captain Kevin P. Lenox, commanding officer of the Nimitz. It’s the crew that is responsible for that success and they should all feel proud of the work they do every day to continue to make those launch numbers grow, said Lenox. As the F/A-18E disappears in to the horizon and the cheers subside, the crew gets back to its regularly scheduled flight operations. Even though Sept. 25 may be a special day for those that work on the flight deck and catapults, it’s just another chance for those working on Nimitz to do what they do best: safely launching and recovering aircraft with the same amount of proficiency, dedication and commitment to Nimitz’ mission in the Arabian Gulf, regardless of what number it might happen to be.